Label Flex was formed in 1998 through the vision of shrewd investors and passionate career “label men”. Since then, the company has grown in size, reputation, equipment, personnel and operational capacity, enabling it to service a wide variety of customers in a cross-section of industries. Our vision is to be the preeminent label converter in Zimbabwe, and the surrounding region. We pride ourselves in offering innovative solutions to your local and international brands. Our philosophy is that our customers are our partners and we will relentlessly work with them to enhance the image of their products. We aim to be the leaders in every sector we serve, to the benefit of our customers, employees and shareholders. 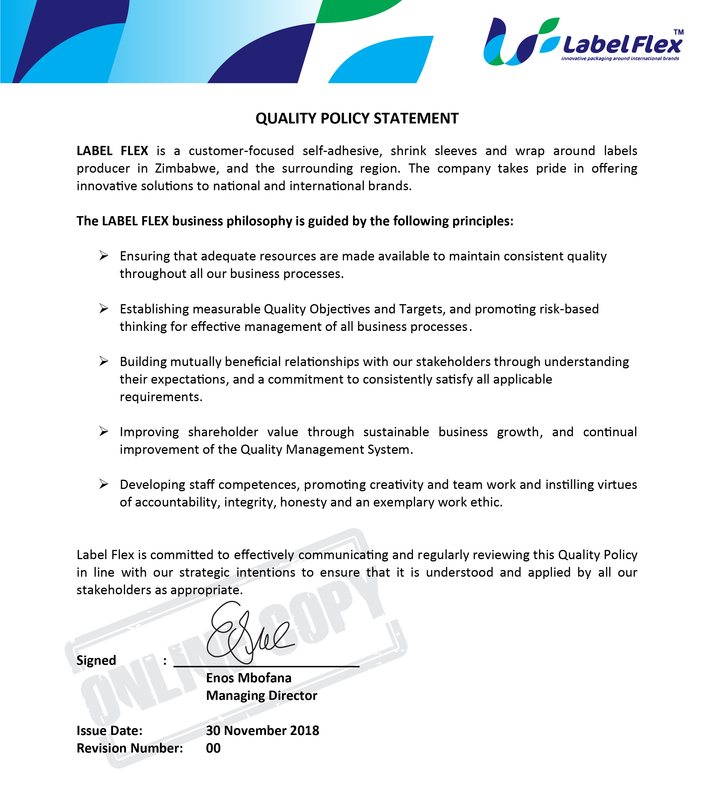 We will achieve this by offering excellent services and outstanding quality through using leading edge technology and embracing a philosophy of unquestionable integrity, honesty and an exemplary work ethic. We are committed to providing our customers with labels that meet or exceed their initial expectations. We achieve this by maintaining the highest quality throughout all our processes, ranging from design to final print. We have an in-house studio that offers design consultancy in order to help produce the best labels for our clients. We have a well-equipped and experienced Sales team that efficiently responds to our customers’ needs. We produce our labels in roll format, however we can supply singles on request. We are capable of production runs of millions of labels. Our customer base is spread throughout Southern Africa. We provide our services to a wide cross-section of industries including, but not limited to the food & beverage, pharmaceutical, chemical & industrial, agriculture and retail sectors. Our in-house studio designs range from either initial concept or from pre-designed artwork that helps in determining accuracy and applicability to our printing processes. Thereafter, proofs are then created and sent to the client for approval before generation of plates for production.